Kent Ambler isn’t like other artists. You won’t have to extract a hidden meaning from his prints or think he’s captured some ineffable feeling with his printmaking. “I do mostly everyday life stuff,” he says. Ambler derives inspiration directly from what he sees, mainly on his 12 acres on Paris Mountain, with his three dogs, two cats, and the bevy of wildlife that call Ambler’s land home. He lived in Indiana and New Mexico before settling in the Upstate in 2000, but his mountain homestead is the main source of inspiration. Everything from his dog resting by its water bowl to the crepe myrtles in the backyard draw Ambler’s eye and eventual hand. His simple subjects may seem mundane, but the “folksy quality” of his work, as Art + Light Gallery owner Teresa Roche describes, has a timeless aura that speaks to a harmony with the wild. Ambler sketches his subjects out before carving them into wooden blocks for the printmaking process. Sometimes five or six blocks are used for a single print. “I purposely make stuff so it doesn’t line up perfectly,” he explains. The imperfections of his carving only add to the work, creating vignettes around figures producing a completely new effect Ambler’s never seen before. “Printmaking has a lot of surprises,” he says. “He’s one of the hardest working artists I’ve ever known,” Roche says of Ambler, who makes a new print about every two weeks and has a studio overflowing with wood blocks and prints ready for patrons. Ambler has been with Roche since Art + Light began 11 years ago, their long relationship culminating in Ambler’s latest show, “Big and Small,” opening on the anniversary of the gallery’s own opening. Ambler is responsible for the “big” part of the show, creating prints no smaller than the average window. “I’ve been pushing lately, trying to go bigger and bigger,” Ambler says. 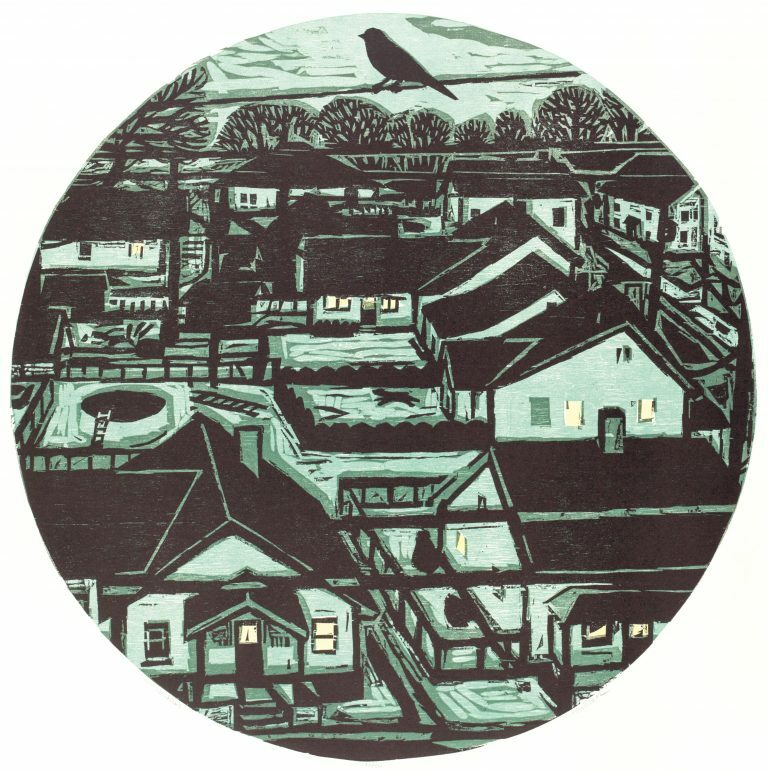 The “small” part of the show is taken care of by Mary Lou Hess, an Indiana printmaker whose work can be as small as postage stamps. Ambler and Hess have been friends since they met at an arts showcase in Kentucky, their mutual admiration of each other’s work the catalyst for the joint show. Opposites Attract // Where Kent Ambler derives direct inspiration from his home and surroundings, Mary Lou Hess may see, hear, or read something that strikes her fancy before transforming it to reflect her vision, such as the detailed flower print. Ambler’s and Hess’s works will be on display at Art + Light Gallery’s “Big and Small” exhibit this month. Both printmakers focus on aesthetics rather than conceptual subjects, but that’s where the similarities end. Hess, who studied at Pratt Institute in the 1950s, has a penchant for intricately detailed pieces that contrast with Ambler’s reverent images that add detail and texture through broad strokes and carefully chosen color. He owns a dozen of her pieces, but they haven’t overtly shaped his art. If anything, his works have evolved in the opposite direction, becoming a photo negative of Hess’s. Where Ambler’s pieces make you take a step back, Hess’s force you to take a step (or two) in, examining the thoughts that were racing through her nimble mind as she etched the tiny details into metal, a sharp image with intentional clarity in contrast with Ambler’s more fluid subjects from a harmonious view of the world. “Big and Small” is on display at Art + Light Gallery, 16 Aiken St, Greenville, August 24–September 30. To view Ambler’s work, go to kentambler.net.